We are committed to QUALITY.CUSTOMERS.SELECTION. EsmokerCanada was established in 2011 and has been advocating vaping ever since. The two founders were pack-a-day smokers who made the switch back in 2010 and haven’t looked back since. Their knowledge and involvement in the vaping community, combined with extensive research, experience and understanding of battling nicotine addiction provides a true understanding of current smokers needs for a cleaner alternative. 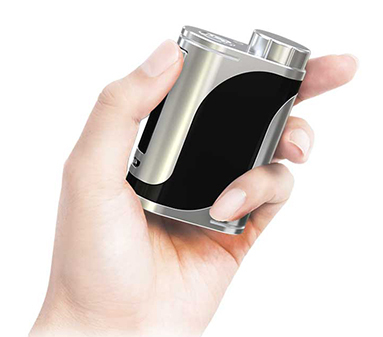 The company takes pride in raising awareness of the electronic cigarette industry; educating consumers on the best e-cigarette device that suits their needs, while providing excellent customer service. All of products include a 6-month warranty and 30 day refund policy* for in store credit. We also include Free Shipping in Canada on all purchases over $75. Come and meet our friendly staff at our vape shop at 676 Yonge St. Toronto. If you’re shopping online and have any questions please feel free to contact us by using our Online Customer Service Chat Support, email us at [email protected] or reach us toll free at 1-888-209-5052. We look forward to helping you make the switch to a smoke-free alternative. EsmokerCanada has a large selection of products that range from high quality vapes devices, herbal vaporizers, premium e-liquid, disposable e-cigarettes and complementary products that will equip our customers with everything needed to successfully make the switch to vaping. At EsmokerCanada we pride ourselves on providing unbeatable customer service. We take the time to walk our customers through the entire process and answer all questions so they are educated on not only how to use the product, but have a better understanding of vaping in general. All of our sales representatives are highly knowledgeable about our products and focus on recommending the right vape device for each individual. Our vape shop is located on Yonge St. in downtown Toronto in between the Wellesley and Bloor substations. Come in and visit us at 676 Yonge St, Toronto, ON M4Y2A6 and meet our educated staff, test our products and sample over 150 of our premium e-juices made in Canada and the USA by reputable manufactures with ISO standard pharmaceutical grade laboratories. If you’re shopping on our website you will find a wide range of vaping products that will satisfy everyone whether you’re a beginner or an advanced vaper. Our products include, but are not limited to, Esmoker 510-T Series, EGO series, disposable electronic cigarettes, advanced mods, compact vapes, a variety of tanks, rebuildables, mech mods, E-hookah’s and much more. 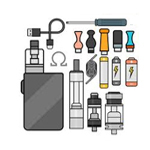 We carry the top hardware manufacturers such as, Aspire, SmokTech, Vaporesso, Eleaf, Joyetech, GeekVape, asMODus, Cloupor, Sigelei, Coil Master, Yocan, Hebe, Horizon, Kangerm, Nitecore, Smiss, Tomo and Flowermate. We only carry high quality premium e-juice from reputable manufactures that maintain ISO standards and are well known for their quality and premium taste. We never mix your e-juice or add nicotine in our store. We leave it to the professionals! Some of the brands we carry are Decoded, World’s Best Custards, 12 Monkeys, Dr. Fog Ice Cream, Dominate, Illusions, World’s Best Jelly Bean, Drinx, Dr. Fog M Series, Naked-100, RAM, Dr. Fog All Stars, Cyrus Vapors, EverCloud Tobacco, I Can’t Believe It’s Not Donuts, Dvine, PurEliquid and Vaplabs. We carry nicotine strengths from 0mg to 24mg. We have also introduced by popular demand a selection of Nic Salts flavours from Premium Labs. E-cigarette devices are smoking alternatives that deliver the sensation of traditional smoking, but are free of toxins, carcinogens and nasty odours. 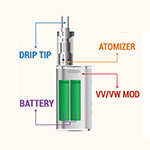 E-cigarettes are offered in a variety of sizes and unique functionalities to accommodate individual needs. Personal vaporizers or vape pens are an economical, environmental and cleaner substitute to tobacco cigarettes which are known to contain thousands of carcinogens and toxic chemicals harming smokers and their loved ones. Switching to electronic cigarettes helps Mother Nature by decreasing the 4.2 billion cigarette butts littered each year by smokers that creates major environmental issues.